Pinwheel Galaxy has an apparent magnitude of 7.86 and lies at a distance of 20.9 million light years from Earth. It has the designation NGC 5457 in the New General Catalogue. The galaxy appears face-on and occupies an area of 28.8 by 26.9 arc minutes of apparent sky, which corresponds to a linear diameter of about 170,000 light years. The galaxy is quite large, but has a low surface brightness and requires exceptionally clear, moonless skies to be seen, even in medium-sized telescopes. The Pinwheel Galaxy can be spotted in 10×50 binoculars under exceptionally good conditions, but only appears as a large, faint patch of light. Small telescopes only reveal the galaxy’s brighter central region, while the spiral structure appears as patchy nebulosity in 4-inch instruments. 8-inch telescopes show the galaxy’s dense core surrounded by a fainter halo dotted with patches of nebulosity and hinting at the spiral structure. Messier 101 is easy to find because it is located just above the handle of the Big Dipper. It forms a triangle with Alkaid and the double star Mizar/Alcor. It can be found 5.5 degrees northeast of Alkaid and at the same angular separation from Mizar. 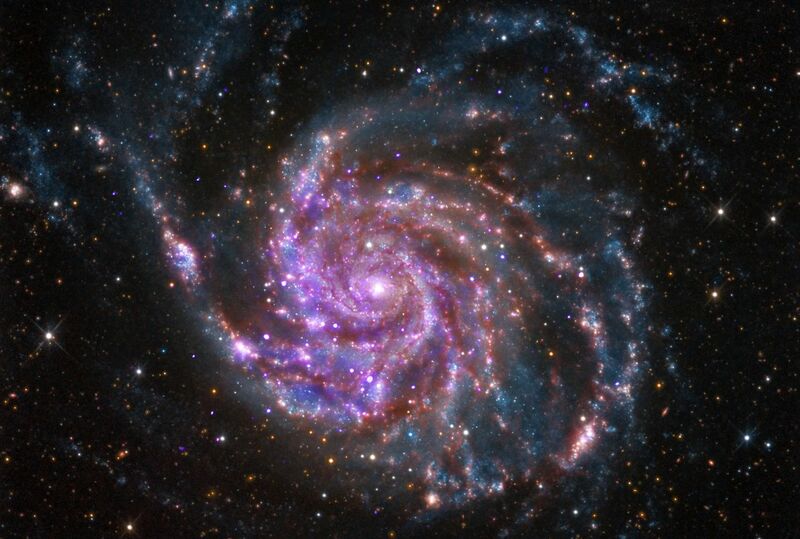 The best time of year to observe the Pinwheel Galaxy is during the spring. Messier 101 is estimated to contain 1 trillion stars. 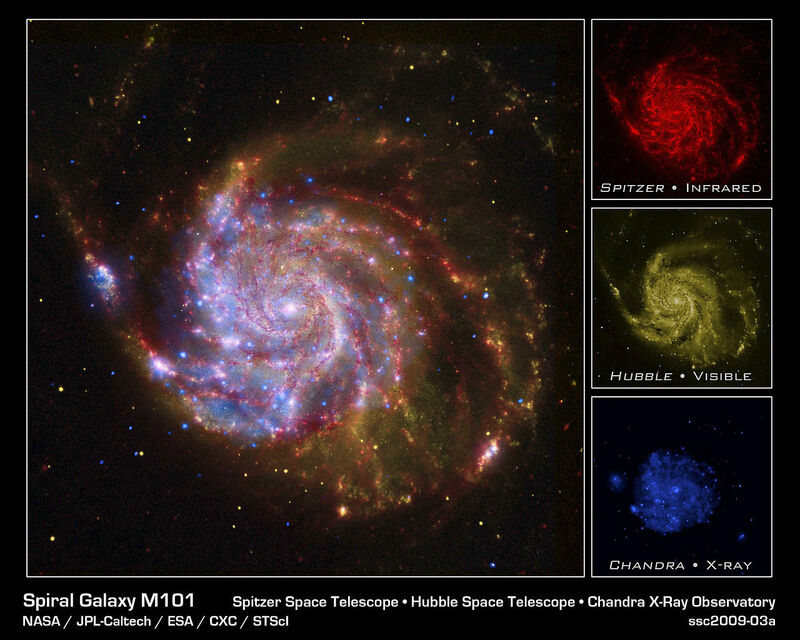 Young and old stars appear to be evenly distributed along the galaxy’s spiral arms, as revealed by combined images of M101 in visible, infrared and X-ray wavelengths. The galaxy has an unusually high number of H II regions, where new stars form, and many of these regions are bright and large, ionized by many extremely luminous and hot young stars. 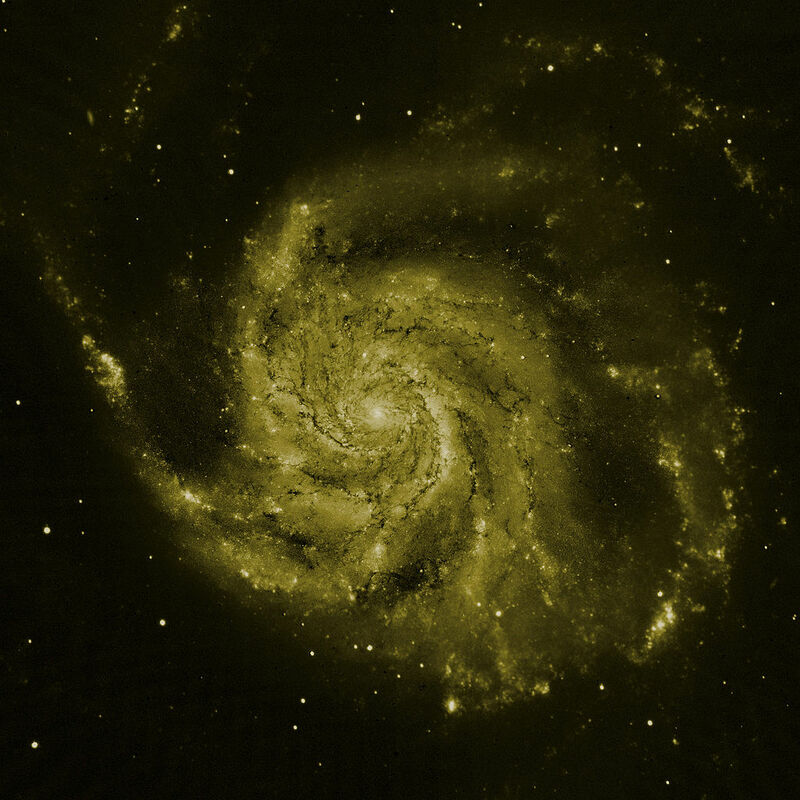 Observations in 1991 led to the discovery of 1,264 H II regions in M101. Three of these were bright enough to get their own designations in the New General Catalogue: NGC 5461, NGC 5462 and NGC 5471. With a linear extension of 170,000 light years, the Pinwheel Galaxy is about 70 percent larger than the Milky Way. The estimated mass of M101’s disk is about 100 billion solar masses, while its small central bulge has a mass 3 billion times that of the Sun. The galaxy has an absolute magnitude of -21.6, corresponding to a luminosity of 30 billion Suns. NASA’s Great Observatories are continuing Galileo’s legacy with stunning images and breakthrough science from the Hubble Space Telescope, the Spitzer Space Telescope, and the Chandra X-ray Observatory. While Galileo observed the sky using visible light seen by the human eye, technology now allows us to observe in many wavelengths, including Spitzer’s infrared view and Chandra’s view in X-rays. Each wavelength region shows different aspects of celestial objects and often reveals new objects that could not otherwise be studied. 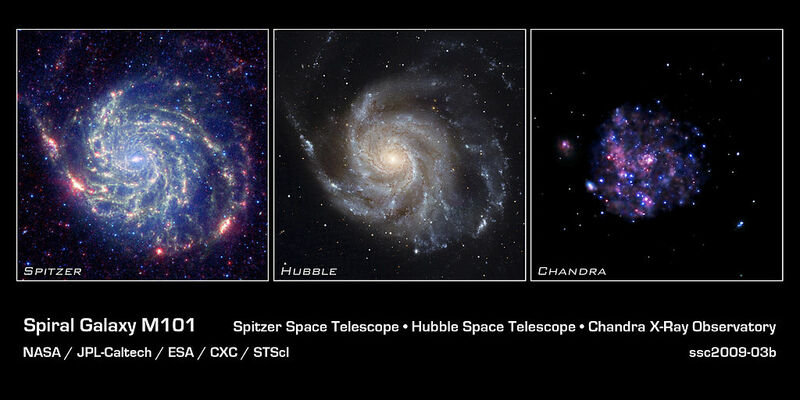 This image of the spiral galaxy Messier 101 is a composite of views from Spitzer, Hubble, and Chandra. The red color shows Spitzer’s view in infrared light. It highlights the heat emitted by dust lanes in the galaxy where stars can form. The yellow color is Hubble’s view in visible light. Most of this light comes from stars, and they trace the same spiral structure as the dust lanes. The blue color shows Chandra’s view in X-ray light. Sources of X-rays include million-degree gas, exploded stars, and material colliding around black holes. The galaxy does not appear to have a supermassive black hole at its centre, as observations in radio and X-ray wavelengths have not detected a strong source of emissions in the galactic core. The Pinwheel Galaxy appears symmetric in images that only reveal its central region, but is really quite asymmetrical as a result of interactions with smaller companion galaxies. The galaxy’s core is displaced from the centre, likely as a result of a collision in the recent past. M101 has five prominent companions: NGC 5204, NGC 5474, NGC 5477, NGC 5585 and Holmberg IV. Gravitational interaction with these galaxies is suspected to have triggered the formation of the grand design structure in M101 and distorted NGC 5474. The galaxy Messier 101 is a swirling spiral of stars, gas, and dust. Messier 101 is nearly twice as wide as our Milky Way Galaxy. Spitzer’s view [left frame], taken in infrared light, reveals the galaxy’s delicate dust lanes as yellow-green filaments. Such dense dust clouds are where new stars can form. In this image, dust warmed by the light of hot, young stars glows red. 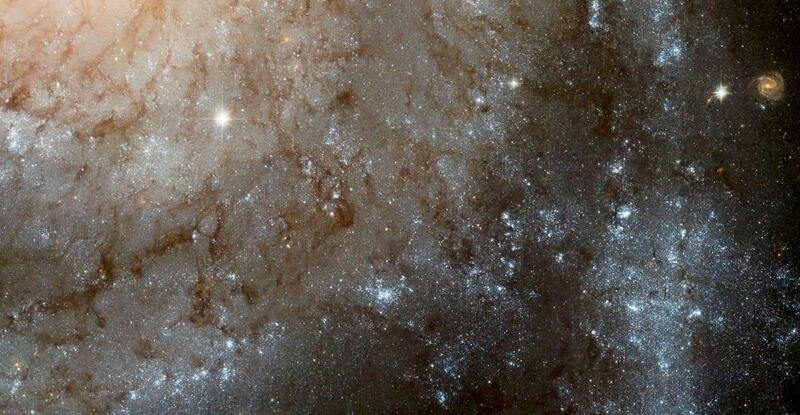 The rest of the galaxy’s hundreds of billions of stars are less prominent and form a blue haze. Astronomers can use infrared light to examine the dust clouds where stars are born. Messier 101 has a pancake-like shape that we view face-on. This perspective shows off the spiral structure that gives it the nickname the Pinwheel Galaxy. In this Hubble image [middle frame], taken in visible light, the bright blue clumps are regions where new stars have formed. The yellowish core consists mainly of old stars. The dark brown dust lanes are colder and denser regions where interstellar clouds may collapse to form new stars. All of these features are shaped into a beautiful spiral pattern by a combination of gravity and rotation. Astronomers use visible light to study where and how stars form in spiral galaxies. The Pinwheel Galaxy and its companions form the M101 Group, a group of at least nine galaxies centred on M101. In addition to the Pinwheel’s companions, probable group members include the galaxies NGC 5238, UGC 8508 and UGC 9405. 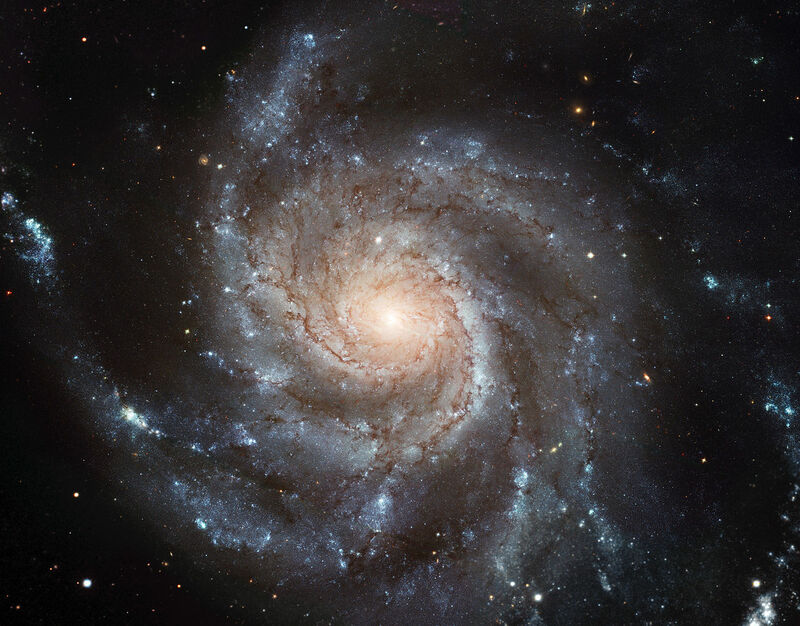 An image of M101 taken by the Hubble Space Telescope in 2006 was the largest and most detailed image of a galaxy to date, composed from 51 individual exposures and several ground-based images. Three supernovae were discovered in M101 in the 20th century: SN 1909A (peculiar type, mag. +12.1) in January 1909 SN 1951H (Type II, mag. +17.5) in September 1951, and SN 1970G (Type II, mag. +11.5) in January 1970. Another supernova was detected in the Pinwheel Galaxy by the Palomar Transient Factory (PTF) on August 24, 2011 at magnitude 17.2. Designated as SN 2011fe, it was classified as a Type Ia supernova, one triggered by a violent explosion of a white dwarf. It brightened to magnitude 9.9 around September 10 and was the nearest supernova seen since 1987. Observations with the Chandra X-ray Observatory identified the X-ray source P98 as an ultra-luminous X-ray source in 2001. An ultra-luminous X-ray source is a source of X-ray emissions more powerful than a single star, but not as powerful as an entire galaxy. 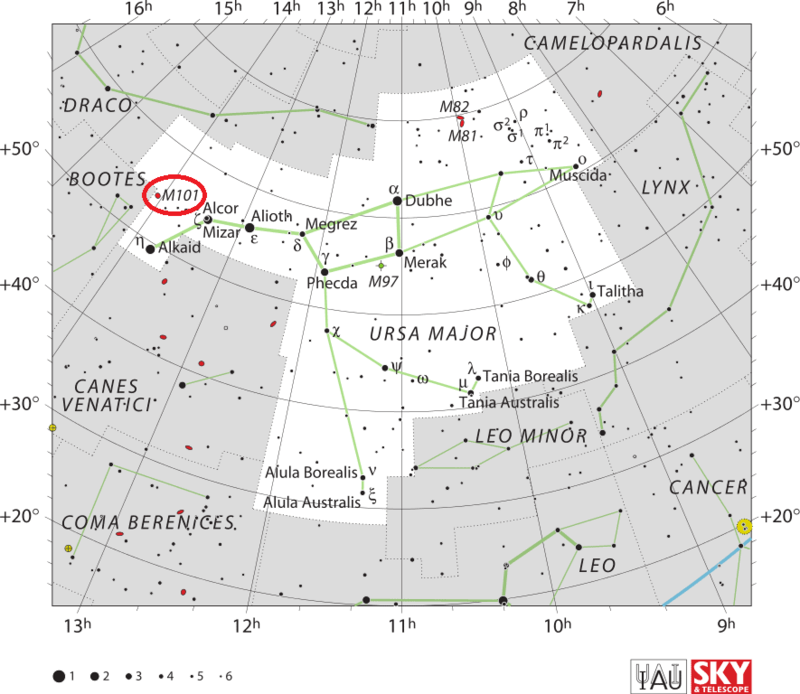 The source was designated as M101 ULX-1. Observations with the Hubble Space Telescope and ESA’s orbiting X-ray observatory XMM-Newton revealed that the source had an optical counterpart, indicating that it was an X-ray binary system. In the northern part is a large star pretty distinctly seen, and in the southern I saw 5 or 6 small ones glitter through the greatest nebulosity which appears to consist of stars. Evening bad. This and the 51st [Whirlpool Galaxy, M51] are both so far removed from the appearance of stars that it is the next step to not being able to resolve them. My new 20 feet will probably render it easy. Very bright, small nucleus with extensive nebulosity, pretty well determined on the preceding [W] side, but very diffuse to the north following [NE]. Includes the two following nebulae [III.788 and 789, NGCs 5461, 5462], and seems to extend 20′, perhaps 30′ or more. A pale white nebula, in the nebulous field np the right hand of Boötes; it is 5d north-north-east of Alkaid, and a similar distance east-half-south from Mizar. This object was discovered by Méchain in 1781, in whose instruments it was very obscure; and it only exhibited a mottled nebulosity to WH [William Herschel]. Under a very favourable view it is large and well spread, though somewhat faint except towards the centre, where it brightens. There are several telescopic stars in the field, one of which is very close to the nebula. From the nature of this neighbourhood, and a trifling uncertainty in the earlier data, this object may be 214 H I [this is actually NGC 5474]; but that astronomer does not appear to have been aware of the identity. It is one of those globular nebulae that seem to be caused by a vast agglomeration of stars, rather than by a mass of diffused luminous matter; and though the idea of too dense a crowd may intrude, yet the paleness tells of its inconceivable distance, and probable discreteness. This unusually beautiful spiral is about 16′ in diameter. There is an almost stellar nucleus, with two bright condensations very close which give a tri-nuclear appearance. The open whorls show a multitude of stellar condensations. [NGCs] 5449, 5450, 5451, 5453, 5455, 5458, 5461, 5462, are simply brighter knots in the great nebula. 10 s.n. Halton Arp included M101 as Arp 26 in his Atlas of Peculiar Galaxies as a “Spiral with One Heavy Arm”.